As well as 12 riders for the shorter, river ride, and nine for the longer circuit, Shane came along with Tricia but, parted ways with the longer circuit to cycle the steeper section of Scenic Road. The nine Geelong Tour riders were Di and Paul, Gail, Lucy, Maryke (Micky), Moira, Angelika, Donna and Helen (ride leader). Donna comes from Bendigo and joined the Women’s Ride after seeing off riders on the final leg (Geelong-Melbourne) of Tour de Transport 2016. She had completed a couple of hours riding, escorting the tour on the start of this final leg along the Ted Wilson Trail before doubling back to join the Little Geelong Tour. The Geelong ride started off through Highton and Wandana Heights, enjoying/enduring the ascent of Ted Wilson Trail from the Ring Road underpass to Pigdons Road. After a side trip around Deakin’s Waurn Ponds Campus, the tour turned west on the old Princes Highway. The furthest point west was Pettavel Road, before the group doubled back to Geelong via Reservoir Road. Donna and Moira left the group here, seeking a faster pace, and breakfast back in Geelong before Donna’s return to Bendigo. The remaining seven riders meandered through paths and roads, through Waurn Ponds, Grovedale and Belmont before crossing the breakwater and heading to the waterfront. By this time the sun had made its presence felt. Coffee at the Boathouse (we resisted the best fish & chips around) was a delightful rest stop – with the light wind giving just enough coolness to make the top deck cool enough). Due to the increasing temperature and extended time – it was now after mid-day – the tour to the north was truncated. Taking the Cement Works Rail Trail from Church Street to the Cement Works meant the group was soon whizzing down Hyland Street and onto the river path for the final few kilometers back to Balyang. Thanks to all riders. Thanks especially to Angelika who was delegated to be ‘tail end Charlie’. With lots of traffic light crossings, the final riders usually miss the lights, so there was lots of catching up – Angelika and Micky coped admirably. We hope that next year’s tour will be even more enjoyable. *International Women’s Day is next Tuesday – March 8th. There’s a good article about the origins of IWD here. 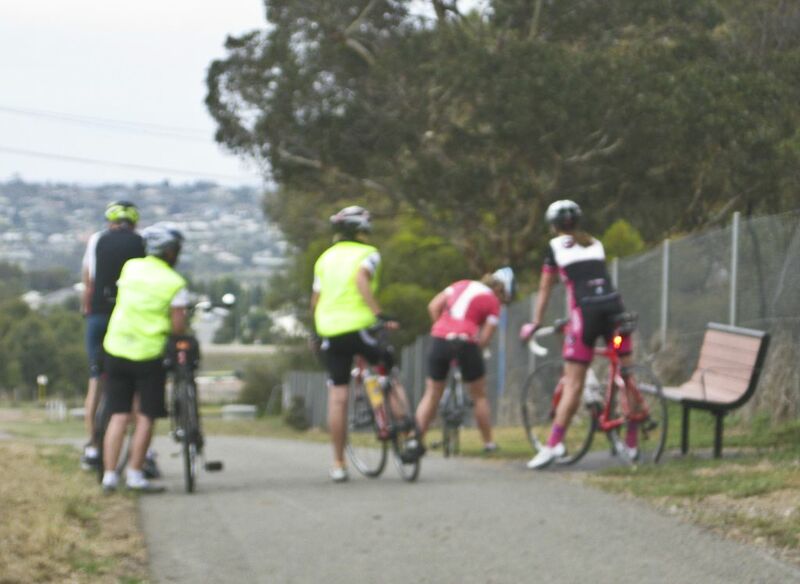 This entry was posted in Cycling events, Events, Ride reports and tagged Barwon River Trail, Geelong Boathouse, International Women's Day, Ted Wilson Trail, Women's Rides by hlyth2013. Bookmark the permalink.